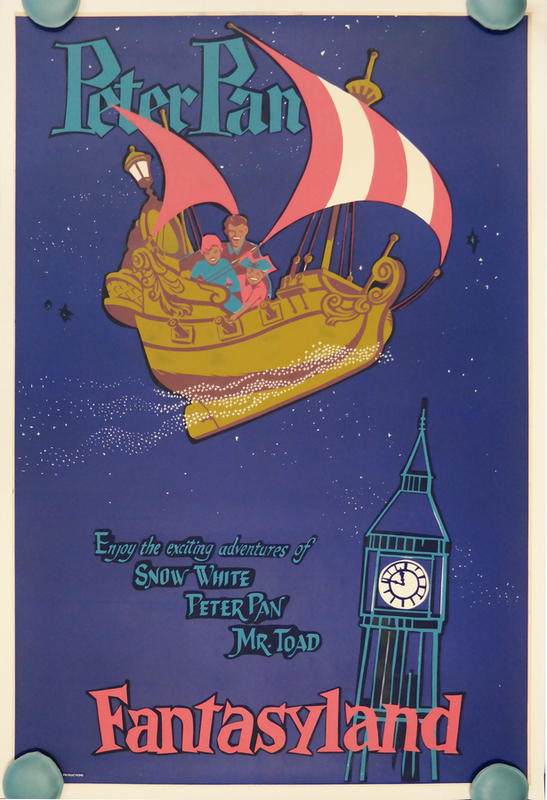 This is an extremely rare original hand-silk screened poster for the Peter Pan's Flight attraction at the Disneyland theme park. This poster, designed by Bjorn Aronson in 1956, is one of the first-pulls which included black shadowing behind the lettering. This detail was removed from subsequent, more common pulls of the image's print. This is one of the few examples of this early poster that we have come across. The post measures 54" x 36" and the condition is good with some minor creasing and flaws throughout, which are barely noticeable after the poster was professionally linen backed for archival preservation. Ships rolled.